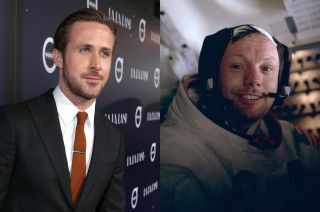 Actor Ryan Gosling (left) will portray astronaut Neil Armstrong, the first man to walk on the moon, in Universal Studios' "First Man" to be directed by Damien Chazelle. "First Man," the upcoming biographical film on the life of Neil Armstrong, has a release date: Oct. 12, 2018, according to Deadline. Armstrong commanded NASA's historic Apollo 11 lunar landing mission, which touched down on the moon on July 20, 1969, among his other NASA work. Apollo 11 lunar module pilot Buzz Aldrin walked on the moon with Armstrong while their crewmate Michael Collins orbited the moon aboard their command module. Five more Apollo moon landings would land astronauts on the moon. Armstrong died in 2012.